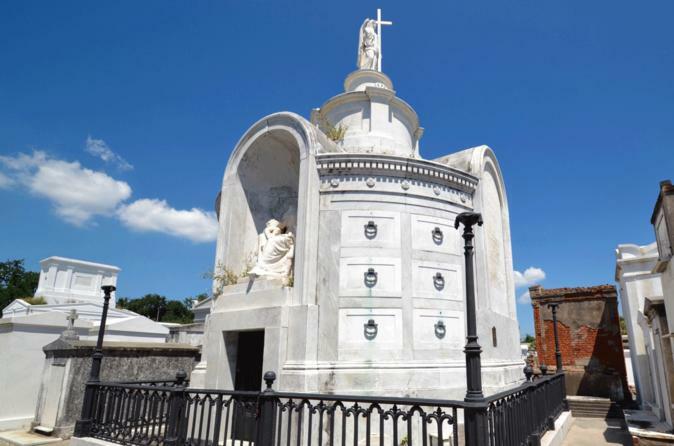 Stroll through the past and present of this fascinating city viewed through St. Louis Cemetery #1 (established 1789) with Robert Florence, author of New Orleans Cemeteries and City of the Dead, and New Orleans' top-rated guides. This burial ground reveals New Orleans history more vividly than any other historic site. Aboveground burial and picturesque decay combine with awesome architectural features for an unforgettable experience. From chess champion Paul Morphy to civil rights pioneer Homer Plessy, and from the tombs of French Impressionist Edgar Degas’ family and actor Nicolas Cage to the New Orleans Musicians Tomb, hear the humorous, tragic and inspiring stories of numerous legendary New Orleanians and see many compelling burial locations, such as the notorious Easy Rider film site and the tomb of Voodoo Queen Marie Laveau. Using Marie Laveau's tomb as a point of departure, venture into the mysteries of Voodoo, exploring the realities and myths of this curious phenomenon. Learn about its ancient West African religious basis and the crossovers it made with Roman Catholicism in slave-holding colonies, and hear about what current practitioners are doing.